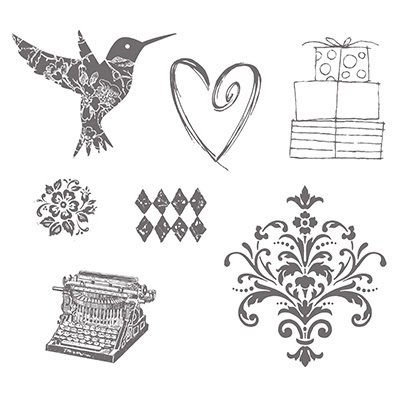 Who better to pick a "Best of" stamp set than the person who helped start Stampin' Up! 25 years ago? Shelli Gardner, our CEO and Cofounder picked her favorite stamp images from the past 25 years and helped combine them into a single set just for you! Even better, this set includes a never before seen flourish image, and the flower image coordinates perfectly with the 3/4" Circle Punch (item# 119873). To see all of the "Best Of" Stamp Sets, click here. 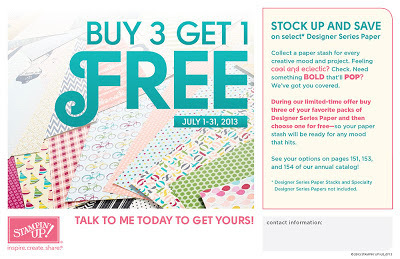 Now through July 31, buy three packages of Stampin' Up Designer Series Paper and get one free! There is no limit to how many packages you can buy, however Designer Series Paper Stacks and Specialty Designer Series Paper are not included in this promotion. To see all your Designer Series Paper options, click here. A brand-new photopolymer stamp set is now available. 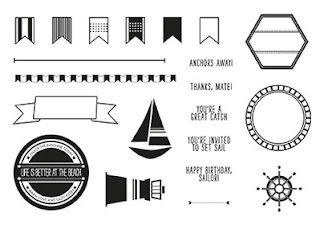 The Settin' Sail Stamp Set is great for vacation memory-keeping, nautical parties, or summer fun. What makes them so great? To see the Settin' Sail flyer, click here. To see the entire collection of photopolymer stamps, click here. All Four of Stampin' Up's Exclusive Washi Tapes: A total of 12 Washi Tape rolls including the new Witches Brew and Season of Style, which are not available to purchase individually until August 1. What to Washi Online Class: Seven sections that feature more than 30 projects with complete instructions and full color photos, invaluable tips and two instructional videos. A package of note cards and envelopes: 20 cards and envelopes, 5" x 3 1/2". 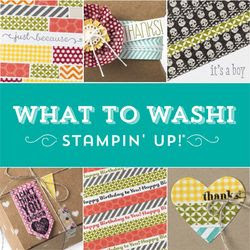 Click here to download the What to Washi flyer. 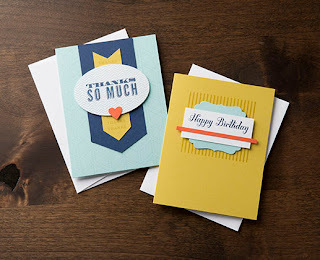 For a limited time, Stampin' Up has made available single markers from the new color renovation. 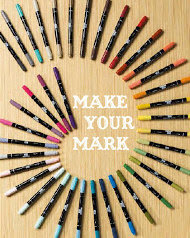 Now through October 31, you can purchase any of these markers as a kit or individually!